Wash and dry your chicken breasts, brush with oil, and season with salt and pepper. While your chicken is cooking, zest half of your orange and set zest aside. Juice the orange and put juice in a small pot on medium-low heat. Add the zest and the rest of the sauce ingredients to the pot and let simmer a bit to combine the flavours. TIP: If you want more of an Asian flavour, add more peppers, ginger and soy sauce. For a light, fresh fruity taste, keep the spices to a minimum and let the orange shine through. When the chicken is cooked, remove it to a plate and tent with foil. Now thicken your orange sauce with a little bit of corn or potato starch. TIP: I find the best way to do this is to remove some of the juice from the pan into a small bowl or cup. Add a teaspoon of starch to the cup and stir until all the lumps are dissolved. Pour the juice with the starch back in the pot and let thicken. Repeat if necessary. This entry was posted in Lunch and Dinner, Recipes and tagged chicken, gluten free, griddler recipes, quick and easy. Bookmark the permalink. 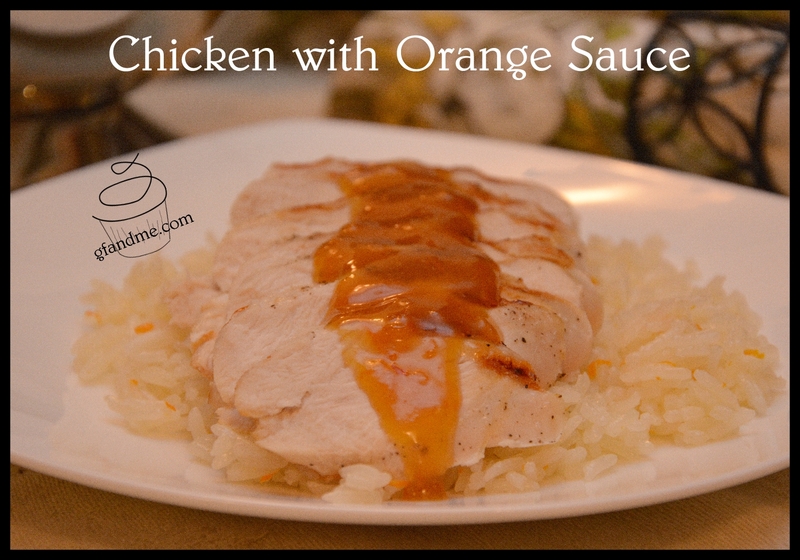 The orange sauce sounds wonderful I am looking forward to making the chicken. Thank you for the recipe. This sounds amazing! I love the combination of orange and ginger.